The present paper aims at studying the role of B7/CD28 interaction and related cytokine production in the immunological changes after exposure to different doses of ionizing radiation. The stimulatory effect of low dose radiation (LDR) on the proliferative response of lymphocytes to Con A was found to require the presence of APCs. The addition of APCs obtained from both low- and high-dose-irradiated mice to splenic lymphocytes separated from low-dose-irradiated mice caused stimulation of lymphocyte proliferation. B7-1/2 expression on APCs was up-regulated after both low and high doses of radiation. There was up-regulation of CD28 expression on splenic and thymic lymphocytes after LDR and its suppression after high dose radiation (HDR), and cytotoxic T lymphocyte-associated antigen 4 (CTLA-4) expression showed changes in the opposite direction. 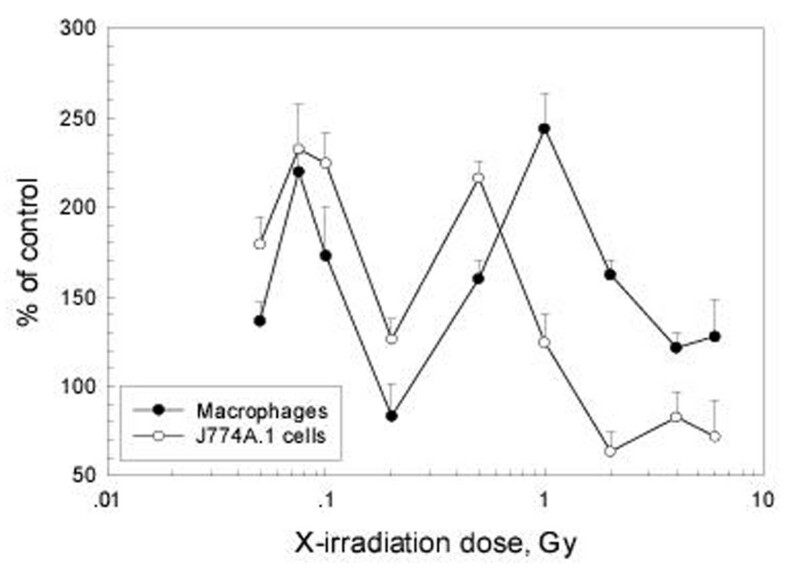 IL-12 secretion by macrophages was stimulated after both low and high doses of radiation, but IL-10 synthesis by splenocytes was suppressed by low dose radiation and up-regulated by high dose radiation. The status of CD28/CTLA-4 expression on T lymphocytes in the presence of up-regulated B7 expression on APCs determined the outcome of the immune changes in response to radiation, i.e., up-regulation of CD28 after LDR resulted in immunoenhancement, and up-regulation of CTLA-4 associated with down-regulation of CD28 after HDR led to immunosuppression. Both low and high doses of radiation up-regulated B7-1/2 expression on APCs. 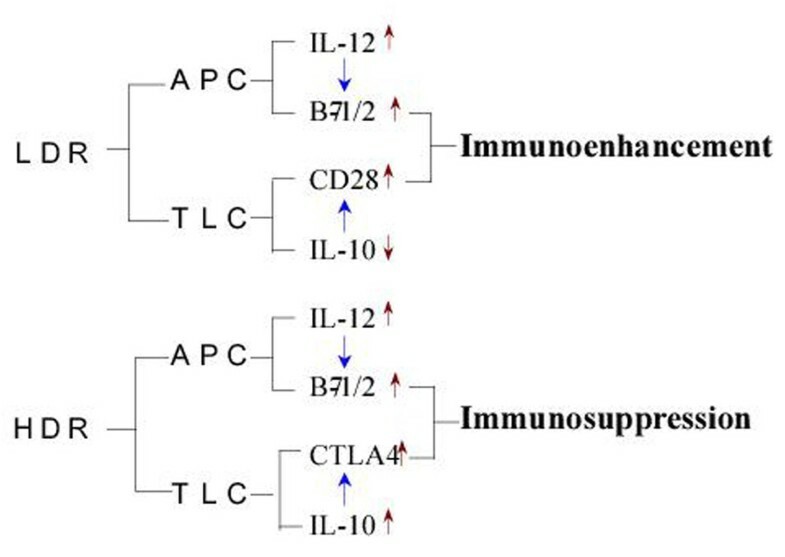 After LDR, the stimulated proliferative effect of increased IL-12 secretion by APCs, reinforced by the suppressed secretion of IL-10, further strengthened the intracellular signaling induced by B7-CD28 interaction. It is well known that the immune system responds to ionizing radiation with distinct characteristics depending on the dose and dose-rate [1, 2]. The prominent suppressive effect of lethal and sublethal doses of ionizing radiation on immunity and hemopoiesis constitutes the basis of the chief clinical manifestations of acute radiation syndrome while the stimulatory effect of low dose radiation (LDR) as disclosed in recent years has even greater significance in understanding the health effects of environmental low level radiation [2–7]. This is the reason why the studies on the mechanisms of the stimulatory effect of LDR have attracted the attention of radiobiologists and health physics workers. It has been demonstrated that LDR enhances T cell activation by facilitating signal transduction and modulating the expression of a number of genes involved in cytokine expression and cell survival in the immune organs . The current model of T cell activation requires two signals [8, 9]. The first signal is specific, requiring T cell receptor recognition and binding to MHC/antigen presented by antigen-presenting cells (APCs). The second signal is nonspecific, resulting from the binding of B7 ligand on the APC with its receptor, CD28, on the T cell. If both signals are provided, the T cell will proliferate and secrete cytokines. Recently, it has been shown that CTLA-4, another receptor for B7 that is up-regulated following T cell activation, can deliver an inhibitory signal, down-regulating T cell proliferation [10, 11]. The role of B7/CD28 interaction and related cytokine production in the immunological changes after exposure to different doses of ionizing radiation remains to be elucidated. In the present paper it is demonstrated for the first time that the cellular interactions between the APCs and lymphocytes play an important role in the distinct changes in the immune response following exposure of mice to different doses of radiation with possible involvement of the costimulatory factors and cytokines in such changes. The importance of the interaction between the APCs and lymphocytes in normal immune response is well known . But the role of APCs in radiation-induced immunological changes has not been fully elucidated. Figure 1 illustrates the importance of the interactions between the APCs and lymphocytes in the proliferative response induced by Con A in normal as well as irradiated states. In this figure there are 5 groups of experiments (A to E) and in each group there are 3 columns marked as (1) lymphocytes from sham-irradiated mice, (2) lymphocytes from 0.075Gy-irradiated mice and (3) lymphocytes from 2Gy-irradiated mice, respectively. In the analysis to follow, these will be designated by the group (A, B, C, D or E) followed by a column number (1, 2 or 3) for comparison of the changes. 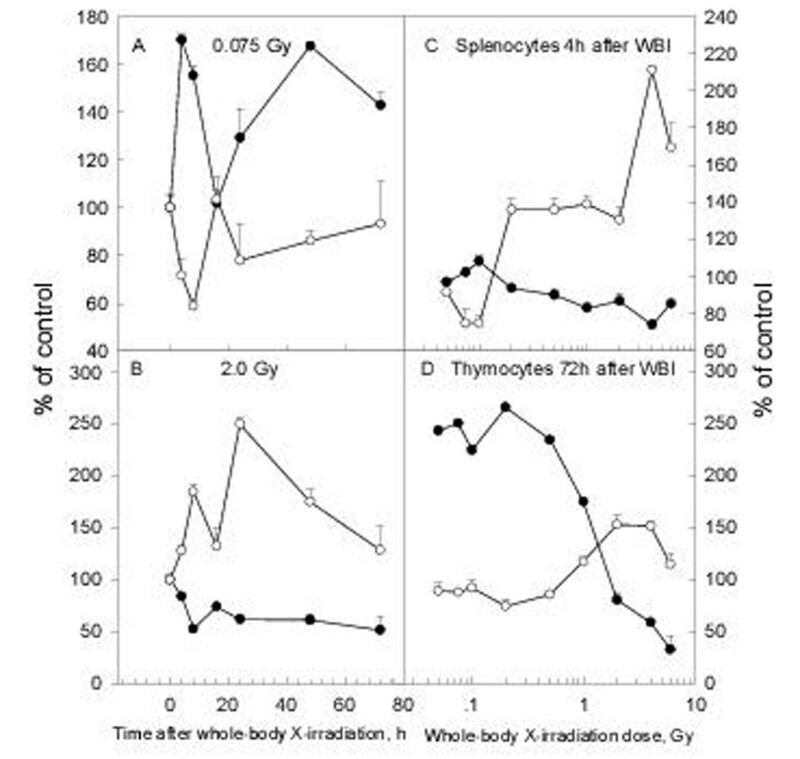 As illustrated in Group A of figure 1, the proliferation of splenocytes in response to Con A after whole-body irradiation (WBI) with 0.075 Gy was significantly up-regulated to a value more than doubling that of the sham-irradiated control (P < 0.002, A1 vs A2), while WBI with 2 Gy caused a profound depression of this reaction to about one third of the control (P < 0.01, A1 vs A3). When splenic cells were depleted of their adherent APCs, the proliferative response to Con A was significantly suppressed (P < 0.001, B1 vs A1). 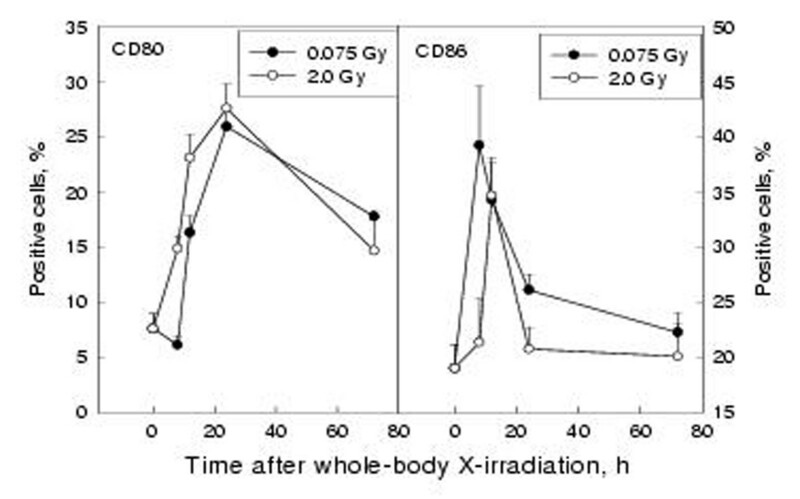 In this case no stimulatory effect was observed for the lymphocytes from the 0.075Gy-irradiated mice (P > 0.05, B1 vs B2; P < 0.001, A2 vs B2), while the suppression of proliferation by 2 Gy was still marked (P < 0.05, B1 vs B3), being more marked than that in the control group (P < 0.001, A3 vs B3). When APCs obtained from the control mice were added to the separated lymphocytes, the proliferation compared to group A was largely recovered for the lymphocytes from the control (P > 0.05, A1 vs C1) and 0.075Gy-irradiated mice (P > 0.05, A1 vs C2), and fully recovered for the lymphocytes from the 2Gy-irradiated mice (P > 0.05, A3 vs C3). But in group C, neither the stimulation from LDR nor the suppression from HDR was significant (P > 0.05, C1 vs C2 and C1 vs C3). When APCs from both the 0.075Gy-irradiated and 2Gy-irradiated mice were added to the separated lymphocytes (groups D and E in figure 1), the proliferative response of lymphocytes from the control mice recovered (P > 0.05, A1 vs Dl and A1 vs E1) and that of lymphocytes from the 0.075 Gy-irradiated mice was greater than the control of each group (P < 0.02, D1 vs D2; P < 0.05, E1 vs E2), and this response was also greater than the normal control (P < 0.05, A1 vs D2 and A1 vs E2). The proliferative response in groups D and E after addition of APCs from the 2Gy-irradiated mice was lower than the control of each group (P < 0.001, D1 vs D3 and El vs E3) and the magnitude of response was about the same as that in group A (P > 0.05, A3 vs D3 and A3 vs E3). A similar phenomenon was observed when secretion of IL-2 was measured as an end point (data not shown) and peritoneal macrophages were used instead of splenic adherent cells as the APCs for both the proliferative response (figure 2 ) and IL-2 secretion (data not shown). The time course of the expression of B7-1 (CD80) and B7-2 (CD86) on peritoneal macrophages was studied after WBI with 0.075 Gy and 2 Gy. It can be seen from the left panel of figure 3 that the expression of B7-1 was markedly up-regulated on peritoneal macrophages after WBI with both low and high doses, with the start of up-regulation being earlier after 2 Gy (8h) than after 0.075 Gy (12h), but peaking at 24 h for both doses. The expression of B7-2 on macrophages was also stimulated (right panel), reaching the peak earlier after LDR (8 h) than after HDR (12 h), and the up-regulation sustained for a longer time after LDR (P < 0.05 for the 24 h point in the 0.075 Gy experiment, but P > 0.05 for the 24 h point in the 2 Gy experiment). The dose-response relationship of the changes in the expression of these molecules showed up-regulation following doses up to 4 Gy with a distinct peak at 0.075 Gy followed by a second peak at 1.0 Gy for B7-1 and at 4 Gy for B7-2. These are illustrated in figure 4 and figure 5 in which both the response of B7-1 and B7-2 on mouse peritoneal macrophages to WBI and that of B7-1 and B7-2 on J774A.1 cells to in vitro irradiation are shown. It should be emphasized that the up-regulation of expression of these two molecules on the peritoneal macrophages after WBI with doses of 0.075 and 2 Gy was statistically significant at multiple time points (P < 0.05 or P < 0.01). The CD28 and CTLA-4 molecules were detected on the surface of splenic and thymic lymphocytes by flow cytometry (FCM) with double immunofluorescence after WBI with different doses. It is seen in figure 6 that WBI with 0.075 Gy caused up-regulation of CD28 expression with opposite changes in CTLA-4 expression on splenocytes (panel A) while WBI with 2 Gy suppressed CD28 expression with opposite changes in the expression of CTLA-4 (panel B). Dose-effect relationship of the expression of these two molecules showed opposite direction of the changes both for the splenocytes 4 h after WBI (panel C) and for the thymocytes 72 h after WBI (panel D). 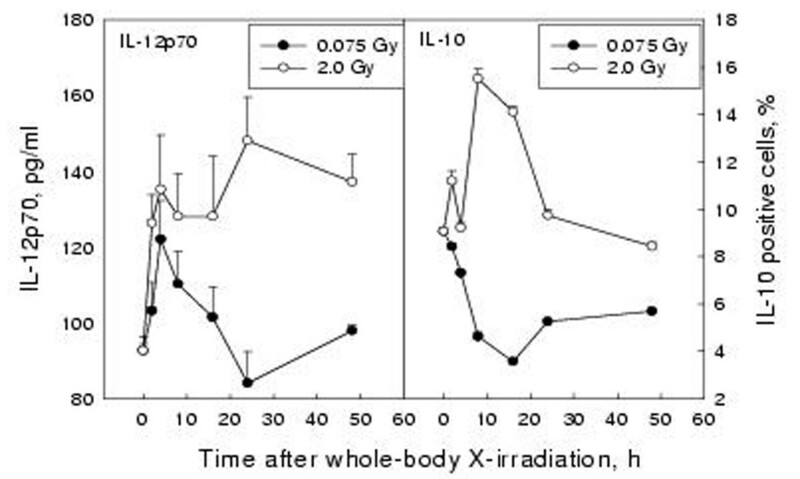 As shown in figure 7, the secretion of IL-12p70 as measured by ELISA was stimulated by both low and higher doses (left panel) with an abrupt increase 4 h after WBI with 0.075 Gy followed by its rapid return to the basal level and a sustained increase after WBI with 2 Gy during the observation period of 48 h. The synthesis of IL-10 in the splenocytes detected by FCM, and expressed as a percentage of fluorescence stained positive cells, was significantly suppressed after WBI with 0.075 Gy and markedly up-regulated after WBI with 2 Gy. (right panel). Macrophages, thymocytes and splenocytes were chosen in this study because they are the most important elements in immune responses. The macrophage is a representative of the APC system and the thymus and spleen are most important central and peripheral lymphoid organs, respectively. The realization of an effective immune response depends upon the interaction between the APCs and lymphocytes, via the expression of surface molecules and secretion of cytokines and other growth factors. In the present paper B7-1/2 expression on macrophages and CD28/CTLA-4 expression on lymphocytes as well as the secretion of IL-12 by macrophages and synthesis of IL-10 in splenocytes were selected as parameters to disclose the possible regulatory roles of these molecules from different cell types in the immunological changes after different doses of WBI. It has been established that the B7 molecules presented by APCs as ligands reacting with their receptors CD28/CTLA-4 on T cells are necessary for the realization of competent immune reactions [8, 12]. The B7-1 (CD80) and B7-2 (CD86) molecules function to drive the helper and cytotoxic responses in the presence of ligation of TCR with MHC-Ag complexes, the latter determining the specificity of the reaction . Such reactions are associated with the action of cytokines [11, 13, 14]. It has been well documented that low dose radiation (LDR) stimulates and high dose radiation (HDR) suppresses immunity [1, 2, 6, 7]. But the role of these molecules in the immune reactions induced by different doses of ionizing radiation is unknown. It is demonstrated in the present paper that depletion of the APCs from the cell suspension of the spleen abrogates the normal proliferative response of splenic lymphocytes to Con A (P < 0.002 for B1 vs A1 in figure 1) as well as the stimulatory effect of LDR on this proliferative reaction (P > 0.05 for B1 vs B2). The suppressive effect of 2 Gy exposure on proliferation of lymphocytes was even more marked after depletion of APCs (P < 0.05 for B1 vs B3 and P < 0.001 for A3 vs B3). This is apparently due to damage of the lymphocytes by this dose since the cells were collected 24 h after WBI. 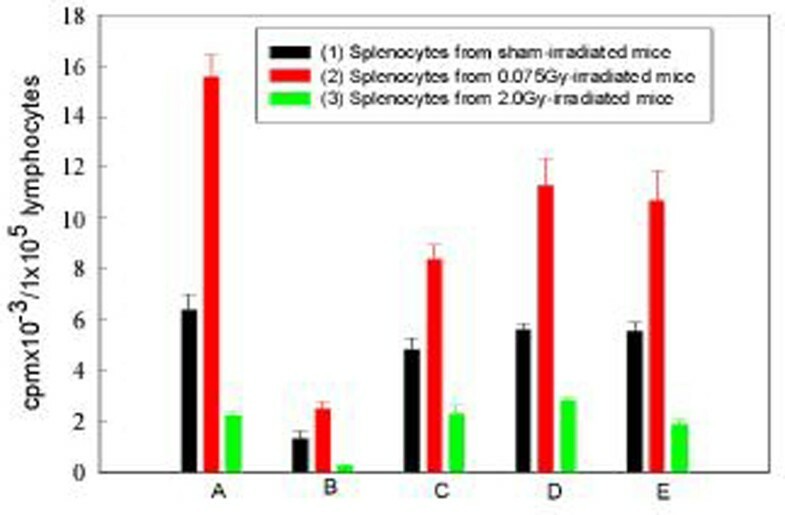 Replacement of the APCs separated from the spleen of normal mice restored the normal proliferative reactions of lymphocytes obtained from sham-irradiated mice (P > 0.05 for C1 vs A1). However, the stimulatory effect of LDR was not restored (P > 0.05 for C1 vs C2) which speaks for the requirement of up-regulation of costimulatory molecules of the APCs for immune stimulation. The suppressive effect of HDR was not significant either (P > 0.05 for C1 vs C3) which may be due to the fact that the recovery of the response of normal lymphocytes had not reached its full strength (C1 being 75.3% of A1) though there was no statistically significant difference between C1 and A1. It is interesting to see that addition of APCs obtained from mice irradiated with either 0.075 Gy or 2 Gy to lymphocytes separated from normal mice also restored the proliferative reaction to the control level (P > 0.05 for D1 vs A1 and E1 vs A1) and stimulated the proliferative response of lymphocytes separated from the 0.075Gy-irradiated mice (P < 0.02 for D1 vs D2 and P < 0.05 for E1 vs E2). This would be readily explained by the observation that the expression of CD80 and CD86 was up-regulated by both low and high doses (figure 3) and that expression of CD28 on splenic lymphocytes was increased after LDR (figure 6, panel A). The observation that the proliferative response of the lymphocytes obtained from 2Gy-irradiated mice remained low no matter whether APCs from either normal or irradiated mice were added could be understood from the up-regulated expression of CTLA-4 and down-regulated expression of CD28 on the lymphocytes after WBI with 2 Gy (figure 6, panels B and C ). The effective regulation of T cell responses is dependent on opposing signals transmitted through two related cell-surface receptors, CD28 and CTLA-4. Dimerization of CTLA-4 is required for the formation of high-avidity complexes with B7 ligands and for transmission of signals that attenuate T cell activation. CTLA-4 belongs to the immunoglobulin superfamily and displays a strand topology similar to vα domains, with an unusual mode of dimerization that places the B7 binding sites distal to the dimerization interface. This organization allows each CTLA-4 dimer to bind two bivalent B7 molecules and suggests that a periodic arrangement of these components within the immunological synapse may contribute to the regulation of T cell responsiveness . In the experimental design we usually first examine the time course of the changes after WBI with 0.075 Gy as LDR and 2 Gy as HDR since in previous studies it has been repeatedly observed that 0.075 Gy usually elicited a stimulatory effect in the immune system and 2 Gy caused immunlogical suppression. Peaking times are then selected to examine the dose-effect relationship. In the CD28 study relatively higher CD28 expression on lymphocytes was observed at 4 h and 72 h after LDR. Therefore, dose-effect studies were made at an early (4 h, figure 6, panel C) and at a late (72 h, figure 6, panel D) stage after WBI. The CD28 and CTLA-4 molecules on the lymphocytes as disclosed by double immunofluorescence with FCM showed opposite changes both in the spleen (figure 6, panel C) and thymus (figure 6, panel D) in the dose-response study with WBI doses from 0.05 to 6 Gy (altogether 10 dose points). A correlation analysis showed that the changes of CD28 and CTLA-4 expression 4 h after WBI with doses from 0.05 to 6 Gy were inversely correlated both for the splenocytes (r=-0.9356, figure 6,panel C ) and the thymocytes (r=-0.9876, data not shown). Only the changes in the thymus were found to be still inversely correlated when examined 72 h after WBI with the same doses (r=-0.8118, figure 6, panel D). A dose of 2 Gy and above suppresses the expression of CD28 with up-regulation of the expression of CTLA-4 (figure 6, panels C and D) and leads to anergy of the T cells despite the up-regulated expression of B7 molecules on the APCs after this dose. This observation in the analysis of the effect of radiation on the interactions between the lymphocytes and the APCs suggests that the difference in radiosensititivity of these two families of the immune cells may determine the outcome of the immune reaction. With LDR the B7 molecules on the APCs and CD28 on the lymphocyte are up-regulated, resulting in enhanced immune response. With HDR the down-regulation of CD28 and up-regulation of CTLA-4 on lymphocytes suppresses their proliferation even with the up-regulated expression of B7 molecules on the APCs. It is known that the immunosuppressive agent dexamethasone enhances CTLA-4 expression during T cell activation . To the knowledge of the present authors there have not been reports on the effect of different doses of ionizing radiation on CD28/CTLA-4 expression on T cells. In addition to the interactions between the surface molecules of APCs and lymphocytes, the nature of the production of different cytokines in response to different doses of radiation is also of importance in understanding the outcome of the immune response. As illustrated in figure 7, the production of IL-10 in the spleen is suppressed after WBI with 0.075 Gy and stimulated after WBI with 2 Gy. On the other hand, the secretion of IL-12 by the macrophages is stimulated after both doses, with a more sustained high level after HDR. It is known that IL-12 facilitates the differentiation of the Th0 cells in the direction of development of Th1 subset while IL-10 opposes this function in favor of the differentiation of the Th0 cells to the Th2 type . The changes in IL-10 and IL-12 at protein level was also confirmed by studies at transcription level with Northern blot after WBI with different doses (reported separately). The observations are in accordance with data from in vitro studies . It has been reported that IL-12 synergizes with B7/CD28 interaction in inducing efficient proliferation and cytokine production of human T cells . Willems et al. stated that IL-10 may exert an inhibitory effect on B7 expression on human monocytes, but this was not observed in the present study on mouse peritoneal macrophages after WBI. However, it could not be excluded that in the high-dose-irradiated mice the increased secretion of IL-10 might facilitate the interaction between the B7 molecules with CTLA-4 resulting in immuosuppression since the expression of both of them are up-regulated and this would inhibit the B7/CD28 interaction. Cell elements within the immune system display differences in radiosensitivity with APCs being much more resistant to ionizing radiation than lymphocytes, as demonstrated in surface molecule expression and cytokine production in the present study. These differences are important factors in the analysis of the immunological changes following different doses of radiation. The different effects of low and high doses of radiation on T cell activation are closely related to the interaction between the surface molecules of APCs and lymphocytes as well as that between cytokines. The following schematic diagram is given to briefly outline the interrelationship of the experimental results obtained in the present study (figure 8). It is understood from the experimental results together with literature analysis that LDR and HDR both stimulate the CD80/86 expression on and IL-12 secretion by the APCs. On the other hand, LDR up-regulates the expression of CD28 and down-regulates that of CTLA-4 on the T cells together with suppressed production of IL-10, thus leading to immunoenhancement, while HDR down-regulates CD28 expression and up-regulates CTLA-4 expression on the T cells together with stimulated IL-10 production resulting in immunosuppression. A schematic diagram illustrating the interaction of surface molecules on and production of interleukins by the immune cells in response to LDR and HDR LDR=low dose radiation; HDR=high dose radiation; APC=antigen presenting cells; TLC=T lymphocytesUpward and downward red arrows on the right side of the symbols separately stand for up-regulation and down-regulation and the blue arrows between the symbols indicate facilitation or stimulation of the process. Male Kunming mice, 6–7 weeks of age, 20–22 g in body weight, obtained from the Department of Experimental Animals of Norman Bethune Medical Center, Jilin University, were used in all experiments. The mice were fed with routine laboratory chow and water ad lib. Collection of peritoneal macrophages, separation of splenic lymphocytes and adherent cells and the co-culture of APCs with lymphocytes were performed 24 h after WBI as previously reported . Briefly, cell suspensions were made from spleens in RPMI1640 medium in glass Petri dishes under sterile condition. The separation of splenic lymphocytes from the adherent APCs was performed (after lysing the red blood cells and washing twice with Hank's solution) by incubation of the re-suspended cells in RPMI1640 with 10% NBS at 37°C in a CO2 incubator in glass Petri dishes for 1 h. This would allow the adherence of the majority of the APCs to the glass wall. This process was repeated 5 times before the non-adherent cells were collected as the separated lymphocytes for experimental use with a purity of >98%. The adherent cells collected after the first incubation were used as the APCs in the co-culture. The co-culture of the lymphocytes with the APCs was performed in 96-well microplates with the addition of 1 × 105 lymphocytes in 100 μl, 1 × 104 APCs in 50 μl and Con A 1 μg in 50 μl in each well. The microplates containing the cell mixtures were incubated under 37°C and 5% CO2 for 72 h with addition of 18.5 kBq 3H-TdR 6 h before termination of incubation. The cells were then collected on glass fiber filters with a cell harvester and the incorporated 3H-TdR was measured in an LKB1214 scintillation counter with the results expressed in cpm per 1 × 105 lymphocytes. The co-cultures from each animal were made in triplicates and 5 mice were used for each data point. Thymocytes and splenocyte for flow cytometric analysis were sampled in the same way but without addition of Con A or 3-HTdR. Treatment of the cells with monoclonal antibodies adhered strictly to the manufacturer's instructions. 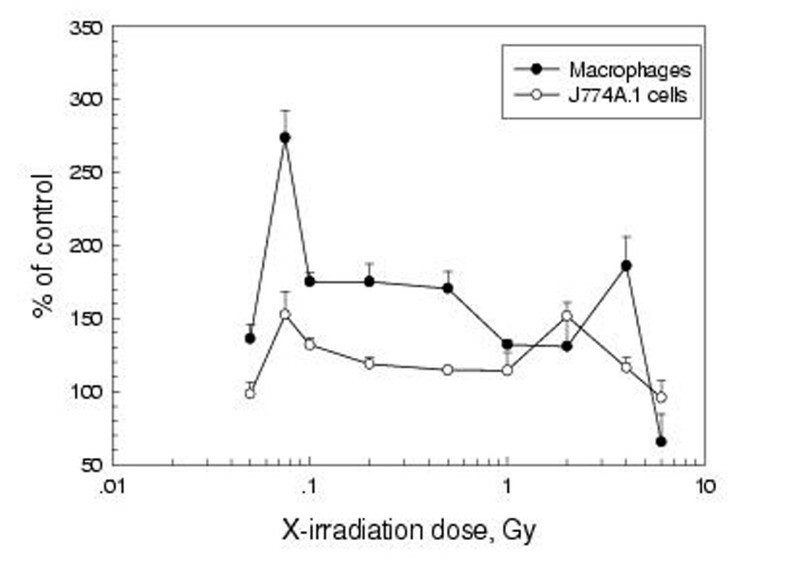 The peritoneal macrophages for measurement of IL-12p70 secretion were obtained from sham-irradiated and irradiated mice at different time intervals after exposure by injection of 5 ml RPMI1640 into the peritoneal cavity and collection of the cell suspension after gentle massage of the abdomen for 1 min. The cell suspensions were centrifuged and the cells were re-suspended in RPMI1640 with 10% NBS before incubation in 6-well plates. 3 × 106 cells in 2 ml (containing LPS 1 μg/ml) were added into each well and incubated at 37°C with 5% CO2 for 72 h before the collection of the supernatant for ELISA of IL-12p70. Samples were made in triplicates and 5 animals were used for each data point. Peritoneal macrophages for immunohistochemical examination of B7-1/2 expression were collected in the same way but without LPS stimulation. X-rays of 200 kVp and 10 mA with 0.5 mm Cu and 1 mm A1 as filters were given at a dose-rate of 0.0125 Gy/min for doses below 0.5 Gy and at a dose-rate of 0.287 Gy/min for doses of 0.5 Gy and above as reported . The immunmological parameters were assessed at different time intervals after exposure as indicated in the results. Expression of B7-1/2 on macrophages was assessed with immunohistochemical examination using 5 mice for each time and dose point . 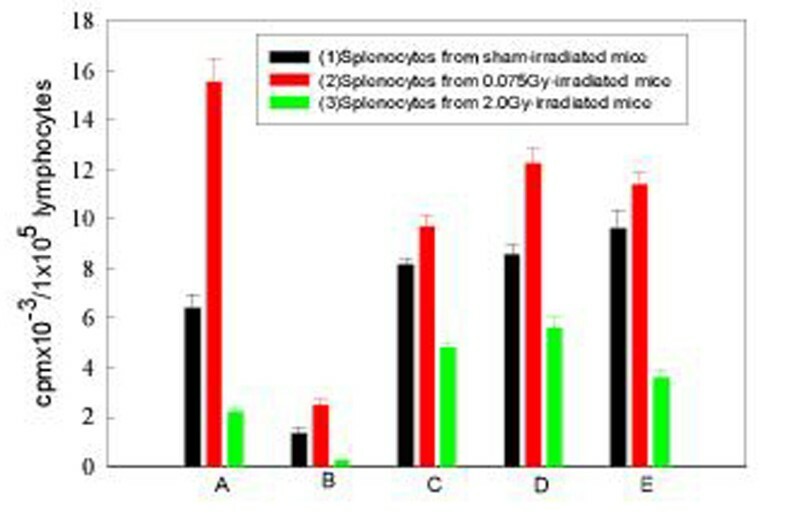 Briefly, cell films on glass slides fixed with cold acetone (3 samples from each animal) were treated with 10% normal goat serum to block the endogenous peroxidase, followed successively by addition of first antibody (rat anti-mouse B7-1/2 monoclonal antibody), second antibody (biotin-labeled goat anti-rat-IgG), streptavidin-labeled HRP (horse radish peroxidase) and DAB developing mixture (containing diaminobenzidine and H2O2). The expression of CD28/CTLA-4 on lymphocytes was examined with flow cytometry (FCM) by double immunofluorescence (anti-CD28-PE and anti-CTLA-4-FITC, PharMingen, USA) according to the manufacturer's manual. IL-10 synthesis was measured with FCM by indirect immunofluorescence using monensin to block the release of the cytokine and saponin to perforate the cell membrane for entrance of monoclonal antibodies (PharMingen). The FCM analysis was made with pooled samples of thymocyte or splenocyte from 2 (CD28/CTLA-4 expression) or 3 (IL-10 synthesis) mice and 5 samples (from 10 or 15 mice) were examined for each time or dose point. IL-12p70 was detected by ELISA (PharMingen). These were performed following the manufacturer's instructions in triplicates for each sample and 5 animals were used for each data point. FACScan machine (Becton-Dickinson, USA) was used for the FCM measurements. Student's t and correlation tests were used in the analysis of the results. This work was supported by funds from NSF of China and IRI of Japan. Thanks are due to Jim Muckerheide for his invaluable comments to the manuscript.